Order your Monteverde Calibra 4-in-1 Desk Set today from FahrneysPens.com. Fine Pens, Refills & Luxurious Gifts – great prices & fast shipping. A perfect addition to any workspace, the new Monteverde Calibra desk set has all you need: a ball pen, a stylus, and a magnetic pen stand that doubles as a ruler. Each Calibra pen and desk base is crafted from milled aluminum and coated with a matte anodized finish. The smooth twist-action mini ball pen is topped with a touch-screen stylus. 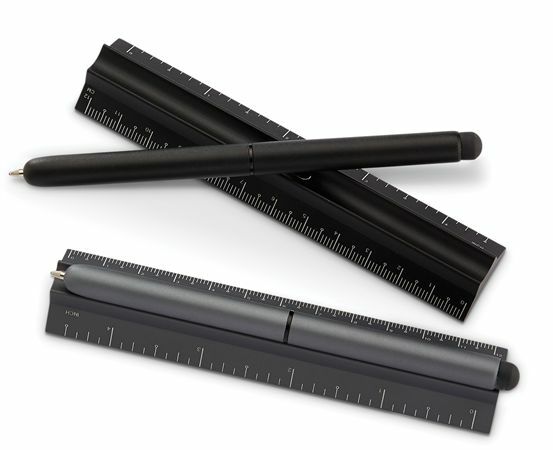 The heavy-duty base features a two-sided ruler, ideal for precision line work. Its grooved pen holder is magnetized to keep your pen secure. 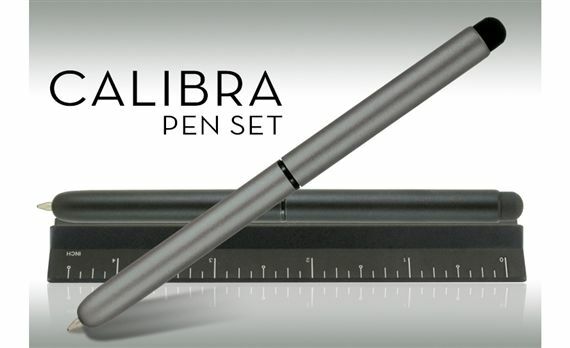 Measuring only 4” long, the minimalist Calibra pen set gives you maximun utility in a small amount of space. Choose from black or dark grey finish.